Mel Chin’s Two Me invited members of the public to pose as living monuments in City Hall courtyard. Whether by foot, wheelchair, stroller, or other means, participants could use one of two fully accessible ramps—built to the standards of the Americans with Disabilities Act—to ascend to one of two seven-foot-tall granite pedestals inscribed with the word “Me.” Each visitor attained monumental status upon reaching the summit, where they also could greet participants on the opposite pedestal and onlookers below. Over 50,000 people took their place atop the pedestals during the open hours of the exhibition, striking poses, offering monologues, performing poetry or song, challenging onlookers in debate, or embracing loved ones. Chin sparked the living tension around monumental histories that balance individual and collective struggles. His work was sited within the hallowed public space at the heart of City Hall, a building with over two hundred works of art dedicated on its apron, carved into its façade, and, in the case of the sculpture of city founder William Penn, crowning its clock tower. Chin modeled his pedestals on the Citizen statue on the east side of City Hall, dedicated in 1927 to local businessman John Wanamaker with the inscription “Citizen.” Chin used granite similarly patterned to the Citizen statue, sourced from a South Philadelphia vendor to present an uncanny site of memory. Partners: Mural Arts Philadelphia, The City of Philadelphia; The Office of Arts, Culture and the Creative Economy; and the Department of Public Property. 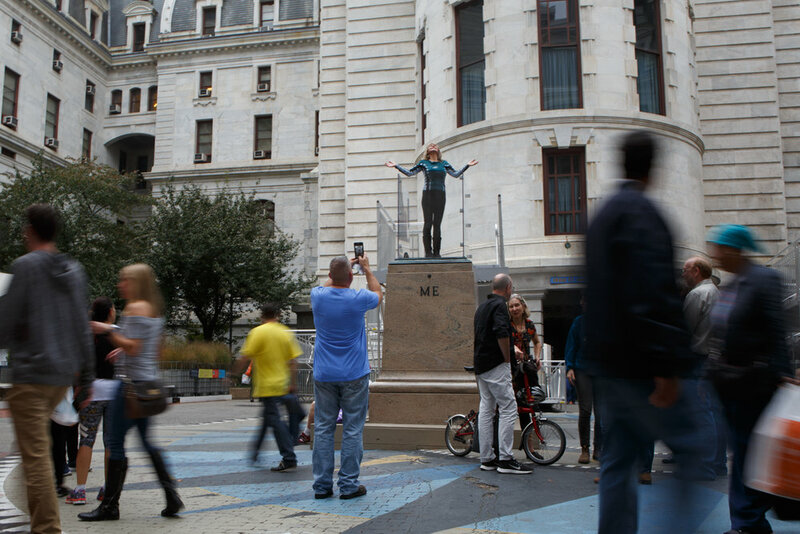 Two Me was presented as a part of the Monument Lab: Philadelphia (2017) exhibition. Concepts framed in early Philadelphia loom monumentally in the public mind and express our American identity. The individual with “inalienable rights” (reinforced by the promotion of rugged individualism in the late 1920s that continues today) is combined with the “We” of “We the People.” These ideas, from two historic documents that define our values as Americans, are brought together as components of a two-part installation, revealing contradictions and activating a curious dialectic. Two identical plinths are fabricated to the exact height, scale, and shape as the pedestal for the John Wanamaker Citizen statue in Philadelphia that sits on the eastern, outward-facing skirt of City Hall. They sit side by side, but not touching. Instead of “Citizen,” both plinths bear “Me” cast in bronze letters. On the backside of each pedestal is an extensive network of ramps to allow full access to members of the public to ascend and pose as living versions of the bronze citizen. Individuals who step up will complete this monument. Mel Chin was born in Houston, Texas. He is known for the broad range of approaches in his art, including works that require multi-disciplinary, collaborative teamwork and works that conjoin cross-cultural aesthetics with complex ideas. He developed Revival Field (1989–ongoing), a project that pioneered the field of "green remediation," the use of plants to remove toxic, heavy metals from the soil. His nationwide Fundred Dollar Bill Project continues to engage and present the public will for an end of childhood lead-poisoning. Mel Chin is an artist resistant to any branding that may fence in his capacity to execute iconic sculptures in any known medium, engage in any territory toxic or social, or encourage the expansion and generational transfer of ideas in any alternative field, the expansion and generational transfer of ideas. His work is exhibited extensively in the US and abroad and was documented in the popular PBS program, Art 21: Art in the 21st Century. Mel is the recipient of numerous national and international awards, including four honorary doctorates. A traveling retrospective exhibition of his work, titled ReMatch, opened at the New Orleans Museum of Art in February 2014. As a follow up to ReMatch which explored his mutative strategies, a solo comprehensive survey, “ALL OVER the PLACE” organized by No Longer Empty and the Queens Museum, is being planned for citywide manifestations for spring 2018.